Jim Sherman is a BFRO investigator from the state of Michigan. Jim is known as being very credible and spends a lot of time in the field. In this video Jim talks about "eye shine." and delves into some of his personal experiences from the field. 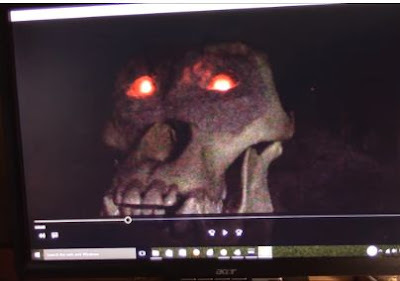 "On multiple occasions and with multiple witnesses I have viewed a single red light in the woods of the Upper Peninsula of MI that responded to my presence. It blinked on and off and moved behind a tree. I even heard whatever was producing the light go crashing through the woods when I brilliantly approached it. I still do not know what it was. However, I decided that if a Sasquatch could produce eye glow (shine), as discussed in the Finding Bigfoot Episode Super Yooper, then I needed to see why I was only seeing a single dull red light. The incidents described happened during the Michigan BFRO expeditions in 2014 and 2015 that I was one of the organizers of. So, obviously, I had Bigfoot on my mind and that could have influenced what I believed I saw. Nevertheless, I have too many papers to grade so I decided to try to test my ideas in a time-consuming manner."